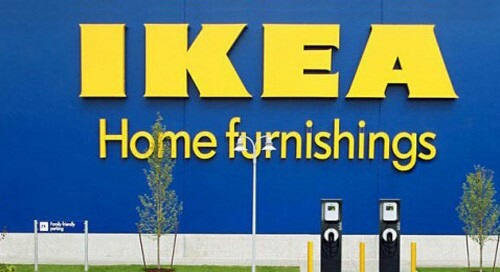 Hyderabad, Aug 9 (IANS) Ikea's first India store, which opened its doors to a huge response by customers on Thursday, offers a world of options for people looking to furnish their homes with products of good quality and yet affordable. The store by the world's leading Swedish home furnishings retailer was teeming with customers in the evening and the total number for the day might cross 30,000 when the store shuts down at 11 p.m.
About 10,000 customers had visited the store by 4 p.m. but the crowds swelled later as thousands of techies headed to the place while returning home from offices. The store was formally inaugurated by Telangana's Industry Minister K. T. Rama Rao along with first customer Rajni Venugopal, IKEA Group CEO Jesper Brodin and Sweden's Ambassador to India Klas Molin. The first India store was opened five years after the world's largest single brand retailer received government approval in 2013 to invest Rs 10,500 crore to open 25 stores in India by 2025. The company now revised the number of stores to 40 across all formats. Its officials on Wednesday said they plan to approach the government with revised investment figures. The sight of concept homes meets the customers as they walk through the sprawling Hyderabad store. The sheer range of products in different room is impressive as the furniture giant has designed them with a promise to make Indian homes brighter and better. The products displayed in concept room are not for pickup but the customers can note down the details to purchase them in the market hall, which has extensive range of products including home kitchen utensils and accessories, textiles, rugs, lighting, decoration, stationary and even live plants. Bringing its world-class shopping experience to India, Ikea has designed the store in a manner which tempt customers into buying something after a long walk through the store that is the equivalent of 10 football grounds. Located in the heart of HITEC City, the information technology hub, and close to the posh localities, the store appears to be designed to target upper middle-class and the rich. However, Ikea claims it is for everyone, irrespective of size of their wallet. Laying a greater emphasis on affordability, Ikea has priced over 1,000 products out of total 7,500 below Rs 200. One finds a set of four spoons for as low as Rs 15. Ikea officials promise there is something that everyone can buy for their homes. "We found love for homes is very big in India. We did not know this. Friends, families, festivals and food all happen at home," Patrik Antoni told IANS. "Unlike countries like China, Taiwan and Korea, people in India celebrate at home and we promise to improve their everyday life," he said. Ikea, in tune with its philosophy, has come out with home furnishing solutions for India by taking people's inputs. The company says its team visited 1,000 homes to understand life at home, frustrations, needs, dreams and aspirations. Ikea, which has stores in 49 countries, has a mixed global range with the local needs and realities. It developed products for local needs including masala boxes, pressure cookers, tawas, idli makers, colourful sheets and mattresses made with coconut fibre centre. Sourcing from India for over 30 years, Ikea is not new to the country. About 1,000 products displayed at the store are made in India. It also tailored 2,000 products from its range to suit Indian needs, taking into consideration climatic realities such as dust and humidity. The unique shopping experience is incomplete without tasting Indian and Swedish delicacies at a 1,000 seat restaurant, the biggest for Ikea globally. Like the products, the food is also affordable with biryani priced at Rs 99 and chicken meat balls Rs 149.